Discussion in 'DC Costumes and Props' started by LOGANCLAW22, Oct 21, 2011. I tried to put together an Arkham suit using the Batman Supreme grey suit I have. I tried to detail the suit and drew on it to mimic the Arkham suit. I made gauntlets and shin armor from foam, latex parts, etc. used my TDK belt because I ran out of time. Got one of Shawn's Arkham cowls (What a thing of beauty!). Man, I just love that cowl. Fits my 24 inch skull like a glove and is so comfortable. I know, I know, might look better with a real cloth grey suit instead of the rubies but what the heck, I had the suit, gave it a shot. Was only put together for the midnight release and a costume contest to try and win a copy of the game. Funny, the seems on the biceps are drawn on to mimic seems on Arkham game costume. Yeah, I did win the contest. Thanks. Pretty awesome replica of the AA suit! Nice Job. Looks great! Did you somehow attach the shoulders to the chest piece? Every time I see the Rubies costume it looks weird because of that seperation. Best work I've seen with that costume! Man thats is insane! love it buddy! That muscle suit is awesome! I love the AA look, great job! Batmans got beef! Great work can really tell AC style! Win it? You must have smashed that contest buddy! Nice suit and congrats on becoming an owner of the new game!!! 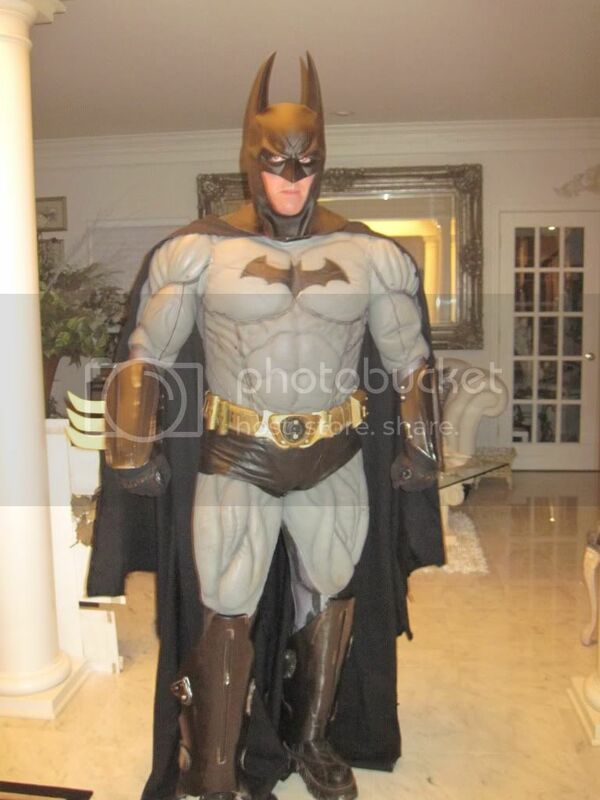 Very Cool Batman suit! i like it! Dude that's awesome, The shin pads, etc really work well. Dave, I did glue the shoulders to the chest. I used a latex fabric reinforcement underneath because the shoulders love to pull away from the chest if you just glue shoulders to the chest with no underneath flexible reinforcement. I never thought that the suit was that bad and I picked it up for $150 some years back so it was well worth it. i would never spend $500 for one now though. What makes the costume though is Reevz666 Arkham cowl. So sweet! Whoa! Makes Batman look puny hahaha, marvelous! Great job on the suit.